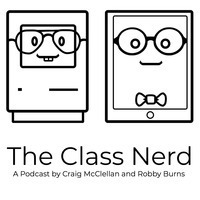 Craig McClellan is a self-described Apple Fanboy ™ and a public elementary school teacher in Nashville, TN. While his passion for all things shiny and technological began at an early age, his love for teaching came later. First, he pursued the highly marketable degree of “commercial guitar,” where he learned jazz scales and complicated music theory, all of which he uses on a daily basis. Upon starting his career in music, he began substitute teaching as a flexible side gig. It wasn’t long until he realized he was happier in the classroom than on the stage. A master’s degree and teaching certificate later, he’s now in his fifth year teaching and loves discovering new ways to integrate technology into his classroom to teach his kids in fun — and more efficient — ways. The Class Nerd marries his two passions — technology and teaching — and he’s excited to share what he’s learned with other teachers to help their kids learn in new ways, too. Robby Burns (Co-host of The Class Nerd Podcast) is a middle school band director and freelance percussionist living in Columbia, MD. In an effort to manage a full time teaching job with a private studio and a performing career, he fell in love with Apple devices and the rich ecosystem of professional software available to them. In recent years, Robby has presented numerous sessions on using technology in the music classroom at music education conferences all over the country. Robby’s first book, Digital Organization Tips for Music Teachers was released in 2016 and is available now from Oxford University Press. Robby has a blog and podcast that focus on music, technology, and productivity. You can follow those and learn more about his musical career at www.robbyburns.com.